Overview: Collection of various trails at Sunrise Mountain in Peoria. Page data reflects what the city designates at the "Intermediate" route. Adjust data accordingly when posting your triplog. Trails are closed from sundown to sunrise. Pets must be restrained on a leash, no longer than six feet in length. Pet waste must be cleaned up and properly disposed. 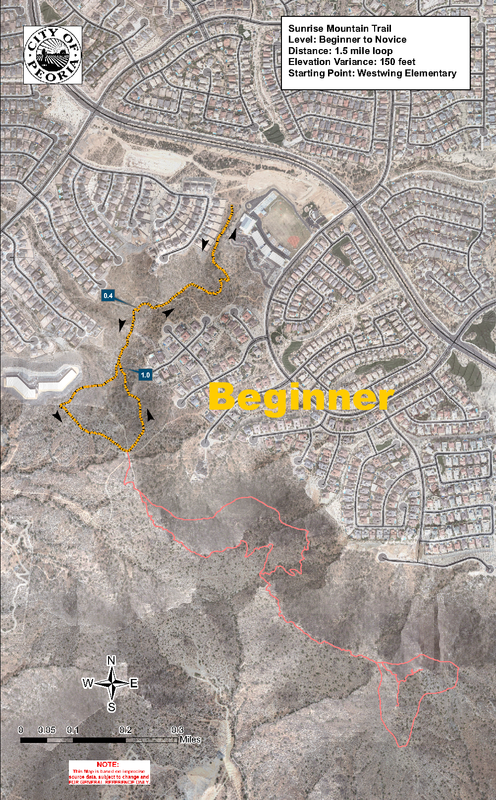 Beginner Trail: 1.5mi / 150ft Map This mountain trail walking path is designed for persons who are just beginning their mountain hiking experiences. The 1.5 mile loop will challenge you with an elevation climb of 150 feet in elevation for the first part of your hike and you will enjoy a level and downhill walking path the second part of your hike. You will observe many of the neighboring community's roof tops along this hike as well as lush desert landscape and native wildlife. This path is an excellent opportunity for you to build your stamina to experience the intermediate walking paths with greater viewing opportunities of Peoria, our neighboring cities, and Maricopa County. Intermediate Trail: 3.0mi / 420ft Map This one is going to get your heart beat going! Get yourself in good shape, or take plenty of resting breaks to experience this intermediate hiking path. You start with a 150' incline for the first half mile to get warmed up. Then the hike levels off for the next half mile. But be prepared because the next two-thirds mile provides a lot of undulation and another increase in elevation approximately 300 feet and some of that incline is steep. There are several opportunities to take a break along this incline that provides scenic views and resting areas if you choose to do so. You will be rewarded when you reach the top of the peak just past the 1.5 mile point with panoramic views a full 360 degrees. On a clear day you will see downtown Phoenix to the southeast, White Peak toward the west, Lake Pleasant and Waddell Dam to the north, and the New River Dam toward the northeast that joins the West Wing and East Wing mountains together. You will be rewarded with downhill and level terrain for the remainder of the hike. The first 1.25 miles of the path is wide enough for two people to pass in opposite directions without needing to slow down or step sideways. Please read and follow all the mountain trails rules and enjoy this heart pumping experience. Advanced Trail: 4.2mi / 420ft Map This hike will be one of the most enjoyable experiences you will have on Sunrise Mountain but you better be in pretty good physical shape to complete the 4.2 mile loop. Compared to the Sunrise Mountain intermediate level hike, this one will challenge you in some more unique ways. While the elevation incline is the same as the intermediate hike, don't let that falsely misguide you... there is a lot more undulation and the inclines are going to be much steeper and challenging... not to mention the distance is an additional mile... but the added length provides better views from several peaks across the mountain ridgeline. You start from the elementary school parking lot and you will continue to climb in elevation for the first three quarter mile. The last quarter mile of that incline is steep and challenging and it will take your breath away if you push yourself. You'll get a little reprieve at this point for the next quarter mile, but you're right back at it with another one half mile incline that is steep and breathless. For the next mile, you will have some undulation as you walk the ridgeline and circle the easternmost portion of Sunrise Mountain. Although this hike does not guide you to the top of this eastern mountain peak, it is a great place to hike to the top and appreciate the spectacular birds-eye view of Peoria, Glendale, and Phoenix. Once you've taken a rest from the top of the mountain, your two mile return trip is a variety of downhill and some uphill undulation that you can enjoy the scenery that the mountain has to offer. Below works but is outdated, most use the designated West Wing TH above. This trailhead serves West Wing & Sunrise Mountains. It is located just NW of Westwing Elementary School. From Happy Valley Rd follow N 83rd Ave north 1.2 miles to Jomax. 83rd turns into Westwing Parkway. Continue on Westwing Parkway 0.9 miles to High Desert Dr. Flip a U turn and continue back 0.15 miles to obvious "T" shaped trailhead. Looking at map before heading out is recommended as it makes more sense with a visual reference in mind. Some park at the school lot off N High Desert Dr when it is not in session to save 0.25 mile flat access trail. There is gate that may be locked and it's not really proper.